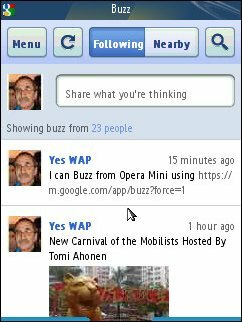 Use Google Buzz In Opera Mini, Bolt, MicroB and Firefox Mobile! Google’s Buzz has certainly generated a lot of negative reactions around the web over privacy issues and the fact that many Android users were denied access to it. Google has been in damage control mode ever since the Buzz launch and has made some changes that go a long way to answering both criticisms. The privacy issue was obviously the more serious. A lot of Gmail users felt that their privacy had been violated by Buzz’s auto-follow feature that defaulted to making their email contacts public. There were also complaints that Google had made it too hard to disable Buzz and to control sharing . Google responded with several changes, including the ability to turn off auto-follow or disable Buzz altogether and made privacy settings easier to find and use. All Buzz users should read The EFF’s tips for using Buzz while protecting yourself online. Google’s explanation of the changes it has made to the Buzz security model here and here are also recommended reading. Older OS versions may be able to access some features, but are not officially supported. Continue on an unsupported device. The “Continue on an unsupported device” link points to: https://m.google.com/app/buzz?force=1 which Jonathan Mallin at Tech Bottle discovered also works pretty well with the Bolt Browser. Inspired by Jonathan’s success I’ve been experimenting with various mobile browsers and found that Buzz is usable with MicroB and Firefox Mobile on the N900 and with Opera’s Mini and Mobile browsers as well. Nokia N900 using either MicroB or Firefox Mobile 1.0 – Some aesthetic issues. Buttons are missing their styling and look like plain text and text boxes are missing their borders, but everything works except that the maps can’t be scrolled at all. Opera Mini 4.2 and 5.0, Opera Mobile 10 Beta 3: Same styling issues as the N900 browsers. Otherwise similar to Bolt with the “Following” page, including posting Buzzes working well but the “Nearby” page unusable without location support. Nokia N95 Browser, UCWEB 7.0: Doesn’t work. Buzz displays a mostly blank page with only “Sign out”, “Send Feedback” and “Help links. Openwave 7 on Motorola i776: Doesn’t work, “Page too large” error. Tip: If you get an empty page in Buzz , try logging into Gmail before vising Buzz. Kudos to Google for opening up the Buzz web app to unsupported browsers. While not everything works perfectly, Buzz is completely functional on the N900 and except for the location features quite usable with Bolt and the Opera browsers. Supporting those three platforms opens up Buzz mobile access to at least 60 million more users. If you are using another unsupported browser like the Palm WebOS browser, Netfront, Obigo or the Symbian V5 browser give https://m.google.com/app/buzz?force=1 a try. This entry was posted in Google and tagged Browsers, Google Buzz by Dennis Bournique. Bookmark the permalink. Nice post. . I’m fully interested in reading all your post. It’s always useful to me. May I tweet your page on twitter? Thanks for running with this on all the different browsers and platforms. I use google maps with MicroB on the N900, and you can use scrolling on google maps when you disable scrolling (fast swipe from the left side of the screen and tap on the arrow that displays). I don’t use use buzz, but I use MicroB with android user agent and the mobile version of most sites now display automatically, among them google apps of course. A very interesting article though. I might give the service a try.